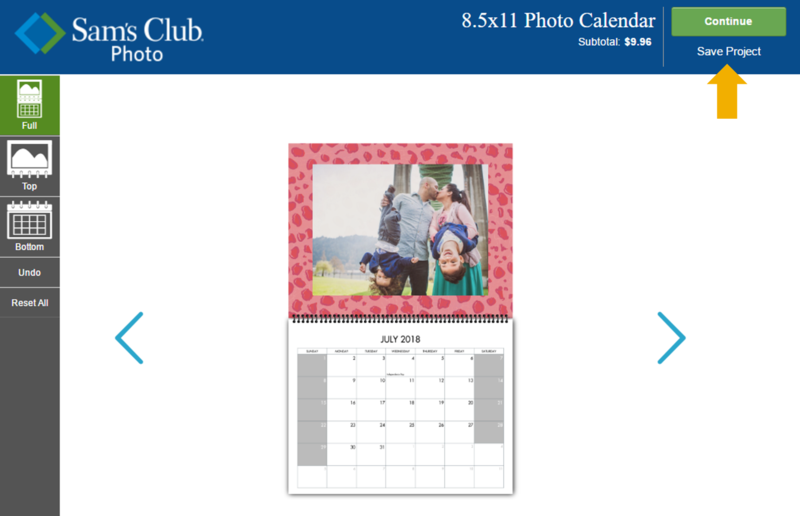 Sam’s Club Photo calendars let you create a beautiful personalized year-round calendar with your own photos. Select Calendars from the main menu. Click to select a Simple Calendar or a Customized Calendar. The Simple Builder is the easiest way to create calendars. Your photos will be automatically added. 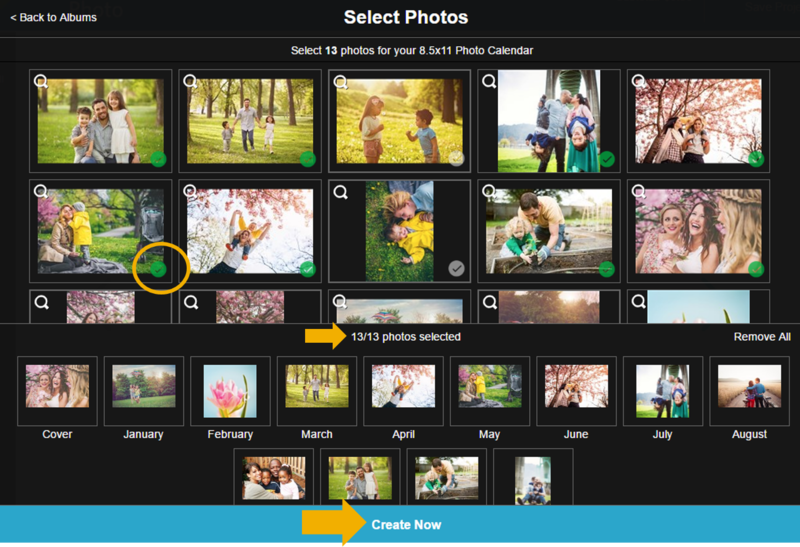 Adjust your photos, layouts and backgrounds to complete your calendar in minutes. The Custom Builder has tools to customize your calendar just the way you like. Rotate, crop, and edit your photos, add personalized dates, and more. The Custom Builder is not available on tablets. Use the drop-down menu to select a size for your calendar. 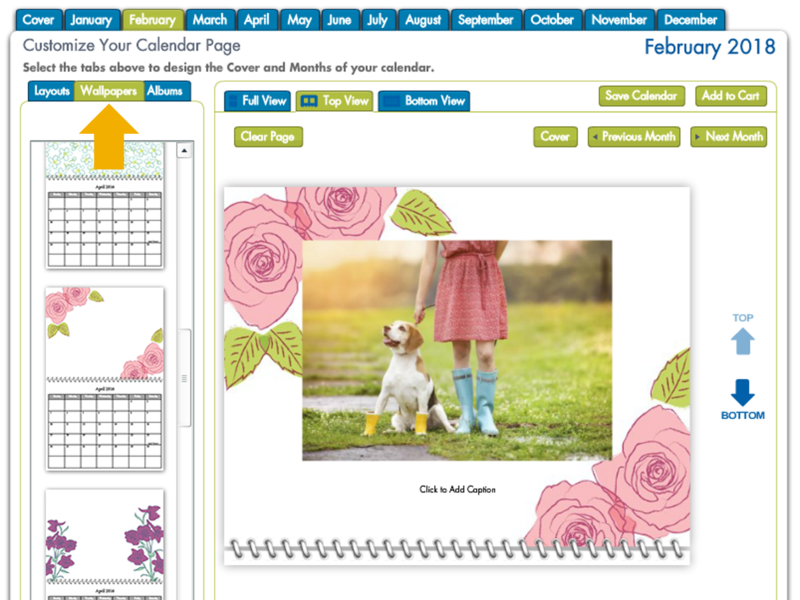 If you are creating a Customized Calendar, you will also choose the starting month now. If you are creating a Simple Calendar, you will choose the starting month later in the design process. You can now design and review your calendar. Choose the starting month for your calendar using the drop-down menu in the top left corner. Calendar themes are organized into categories on the left. When you find the theme you wish to use, click on it to proceed. You will now be shown a list of all of your Sam’s Club Photo albums. Click on an album in the list, then click on the photo you wish to use for the cover of your calendar. The photo will appear at the bottom of the window. Click on a month in your calendar, and click on the photo you wish to use for that month. Repeat this process for each month in your calendar. Selected photos have a green checkmark. You can remove an assigned photo by placing your mouse cursor over it and clicking the red “x” symbol that appears. The number of photos needed appears above the list of selected photos. 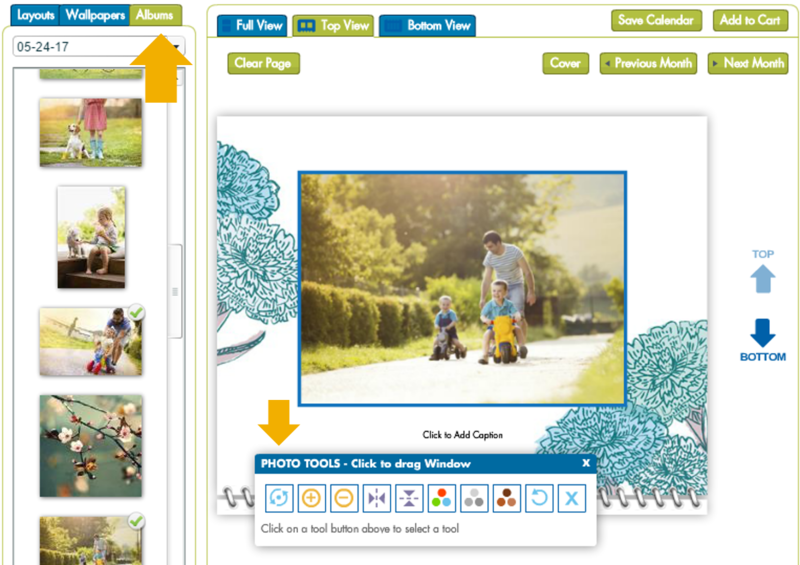 When you have assigned a photo to the cover and each month, click Create Now. You can view each page of your calendar by clicking on the arrow on either side of it. Use the “Full”, “Top”, and “Bottom” buttons in the left toolbar to look at your calendar in different ways. Beneath your calendar is the elements tray. Click and drag to open or close the tray. From here you can click View Albums to browse through your albums or upload new photos by clicking Import Photos. 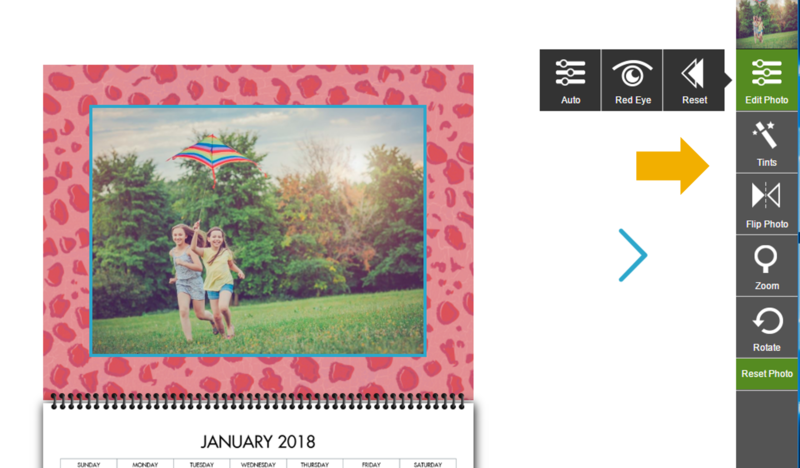 To swap a photo on the calendar, simply drag it from the tray onto the photo that you want to remove from your calendar. Click Layouts from the elements tray and choose a new layout for a page of your calendar by dragging a layout from the tray and dropping it onto the page you want to change. 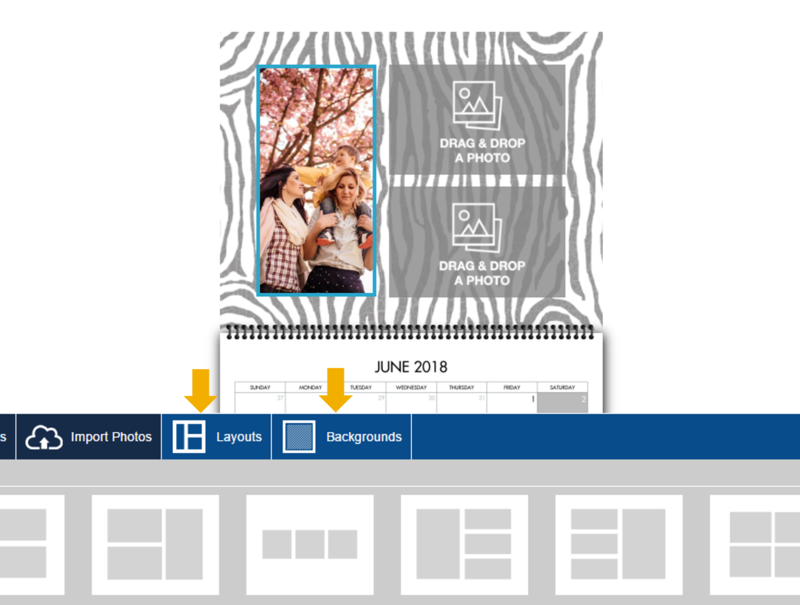 Click Backgrounds from the elements tray and choose a new background for a page of your calendar by dragging the background from the tray and dropping it onto the page you want to change. Edit Photo: Click Auto to auto-balance the photo’s brightness. Click Red Eye to remove red eye in your photo. Click Reset to remove any Auto or Red Eye changes. Tints: Make your photo black and white or sepia-toned. To remove any tints, click Original. Flip Photo: Flip a photo horizontally or vertically. Zoom: Zoom in or out on the photo. Rotate: Rotate the photo clockwise or counter-clockwise. Reset Photo: Reverse all changes made to the selected photo. When you are finished with your calendar, click Continue. Confirm that you have reviewed your project by clicking Approve. Once you have set your initial Customized Calendar options you will be taken to the calendar builder. Calendar themes are listed in the menu on the left. 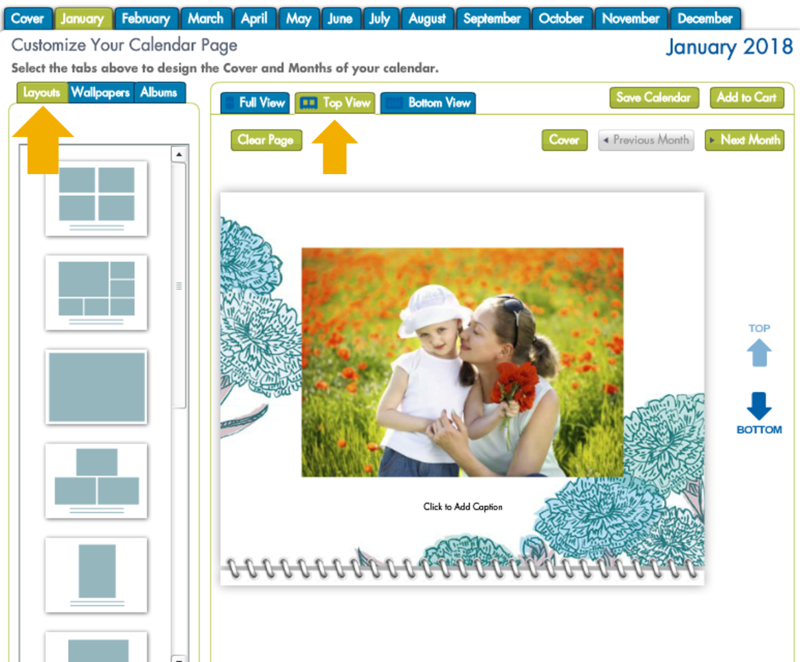 Click on a theme to view the design, then click Select to create your calendar with that theme. You are now in the custom calendar builder. Use the Next Month and Previous Month buttons to move through the pages. Use the Full View, Top View, and Bottom View buttons to look at each month in your calendar in different ways. 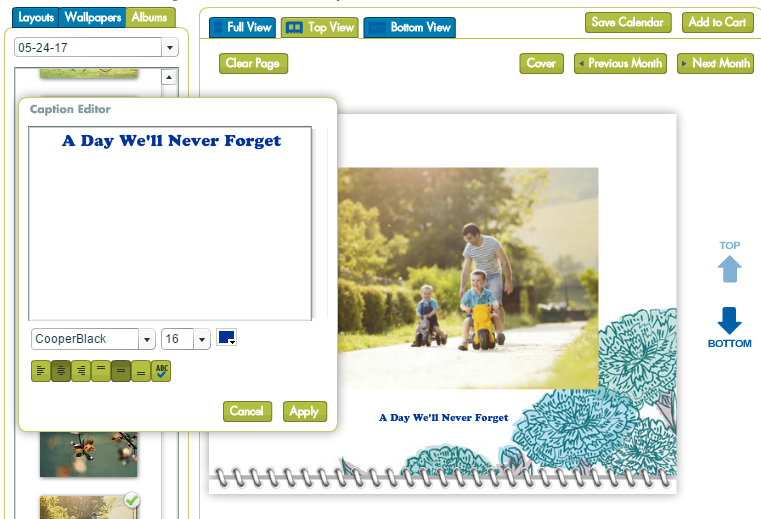 Click the Layouts tab and choose a layout for your cover by clicking a preview from the list available. Next, click the Wallpaper tab and choose a wallpaper (background) for your cover by clicking a preview from the list available. Then, click the Albums tab. You can add photos to your cover by dragging and dropping them into the empty area in the layout on your cover. Use the drop-down menu above the photo thumbnails to navigate between albums. Repeat steps 1-3 for each month in your calendar. Once you’ve added a photo to your calendar, click on it to open the editing tools. Use the tools to rotate, zoom, flip, or add tints to your selected photo. If your layout provides an area for a caption, click that area to edit the text. Enter your text, change the font color, size, justification, and more. Then, click Apply. To customize specific important dates of the year, navigate to the bottom view of a month and click on a date. In the Date Editor window, drag and drop a background photo from the albums on the left, and use the editing tools below if needed. 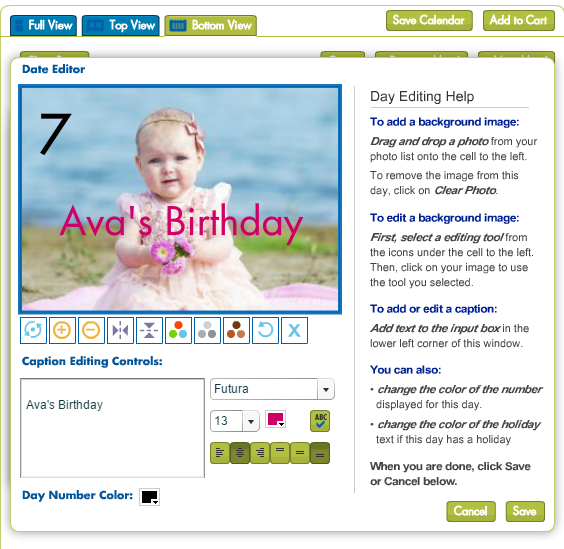 You can also add a caption such as “Eva’s Birthday” into the text box, and modify the font and alignment of the text. To change the color of the date’s number, click on the color swatch at the bottom of the window. When you’re done, click Save. 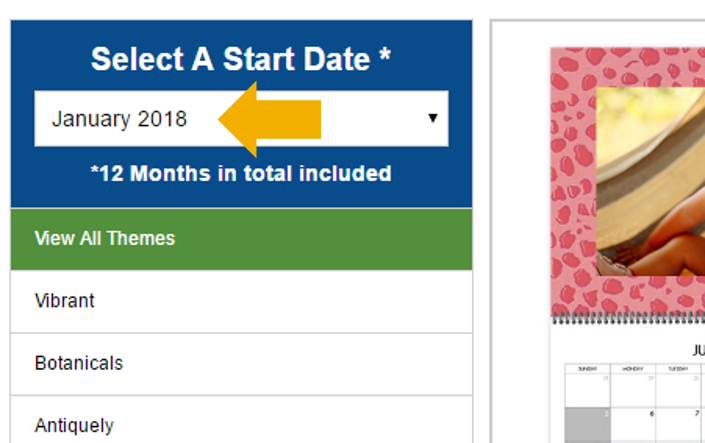 When you are satisfied with your calendar, click Add to Cart.